My absence from blogging does not mean have been slacking off - quite the opposite, in fact! And I do intend to share some new things really soon. In the meantime, I wanted to remind eveyone that the Sweet Figments giveaway closes tomorrow. 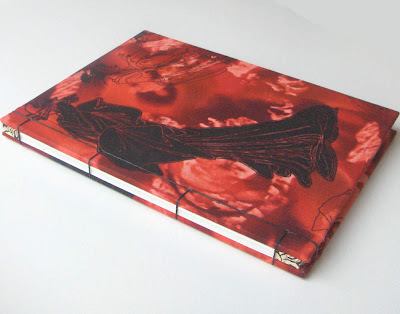 There are 30 handmade goodies up for grabs, including a handbound leather journal made by me. Hop over to the Sweet Figments blog to find out how you can win! Rhonda- I so love those earrings! I hope you will be making more. Those earrings are sweet -- is the hook sewn into the binding? If so, that's quite clever -- would love to do that myself (just hadn't thought of it) -- much better than just poking a kidney wire through, and easier for people like me that don't do the wire work! Those earrings are very cute. Thanks so much for let me enjoy the beauty of the world. 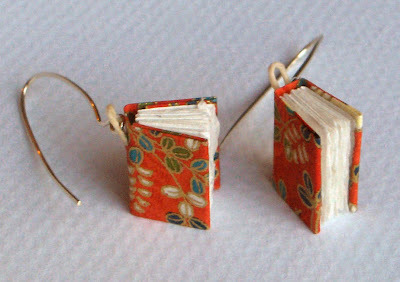 I do have a loop coming out of the little books to attach the ear wires - i think they hang better like that. 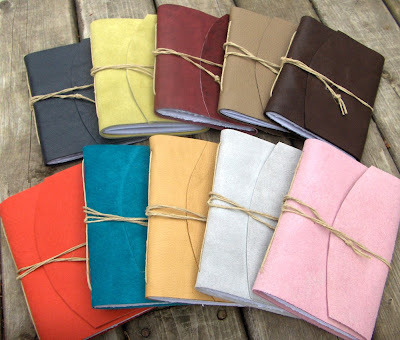 I LOVE the small leather notebooks! Let me know if they are up for sale. I'm such a sucker for those rainbow colors, makes me want to buy every single one! !